Please excuse this miserable photo taken from Martha Stewart Living magazine. But the idea is so cool - I had to share. I'll re-type the above instructions for clarity. 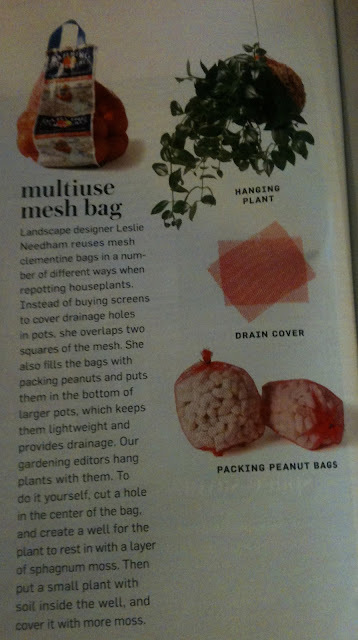 "Landscape designer Leslie Needham reuses mesh clementine bags in a number of different ways when repotting houseplants. Instead of buying screens to cover drainage holes in pots, she overlaps two squares of the mesh. She also fills the bags with packing peanuts and puts them in the bottom of larger pots, which keeps them lightweight and provides drainage. Our gardening editors hang plants with them. To do it yourself, cut a hole in the center of the bag, and create a well for the plant to rest in with a layer of sphagnum moss. Then put a small plant with soil inside the well, and cover it with more moss."